While advisors are intellectually curious about all manners of topics, its investing that really gets them going. While advisors are intellectually curious about all manners of topics, it’s investing that really gets them going. 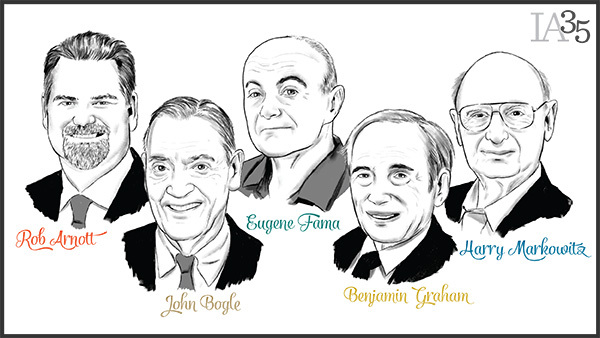 When it comes to investing theory and application, these five men being honored as part of the 2015 IA 35 tend to be in every advisor’s pantheon. Interestingly, these are also men who have strong personal connections with each other—either as student and teacher, mentor and mentee or business advisor and entrepreneur. Not that they always agree, but even in their criticism and, in some cases, their aversion to suffering fools gladly, they’re more interested in getting to the truth than they are in scoring debating points.